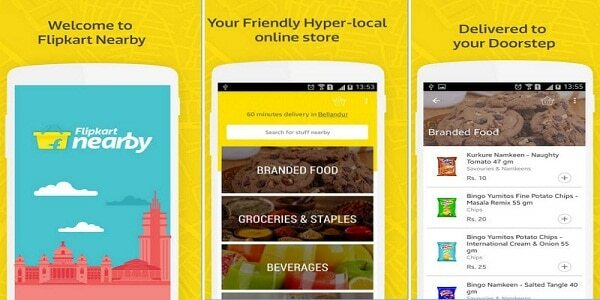 After other e-commerce giants move towards grocery service, the big billion venture Flipkart also has finally launched an app for grocery service, Flipkart Nearby. The service which is currently available only in selected parts of Bangalore such as Koramangala, HSR Layout, BTM Layout, Ejipura, Jayanagar, JP Nagar, and Bellandur not only deals with the grocery items but also with the personal care products, health and wellness products like sanitary napkins and condoms, baby care products, and household supplies. Users can place order at any of the time through the Flipkart Nearby app but the delivery is limited to 10am to 8pm at present. Flipkart doesn’t seem to have a Web equivalent of the same feature that can be accessed on the browser. The app currently only accepts cash-on-delivery for payments. Other e-commerce giants like Amazon, Snapdeal and Paytm had already made its entry into the Indian online grocery market with Kirana Now in March 2015,Nature’s Basket in January 2015 and Paytm Zip. Ola has also started its pilot project to deliver groceries in June 2015. In September 2015 PepperTap received $36million from Snapdeal to grow its foothold in online grocery space. In August, online grocery retailer BigBasket.com had also raised $50 million in a fresh round of funding led by existing investor Bessemer Venture Partners. On the other hand, Bangalore-based ZopNow raised $10million from Dragoneer Investment Group with participation from existing investors Accel Partners, Qualcomm Ventures and Times Internet in April.Grofers and LocalBanya are the other players in the segment to have recently secured funding.